I didn’t blog over the summer, but I did cook. I cooked a lot of chickpeas – yes, I said cooked. I buy them dry and cook them in the slow cooker: rinse and pick over 2 cups of dried chickpeas. Add to 6 cups of water in the slow cooker. Cook on low 6-8 hours. You’ll get about 6 cups of cooked chickpeas. When a recipe calls for 1 can of chickpeas, I use about 1 1/2 cups. Why cook them instead of opening a can? I really think they taste better. I haven’t done the math, but I think it’s got to be cheaper to buy them dried instead of canned. Here’s what they look like before cooking. 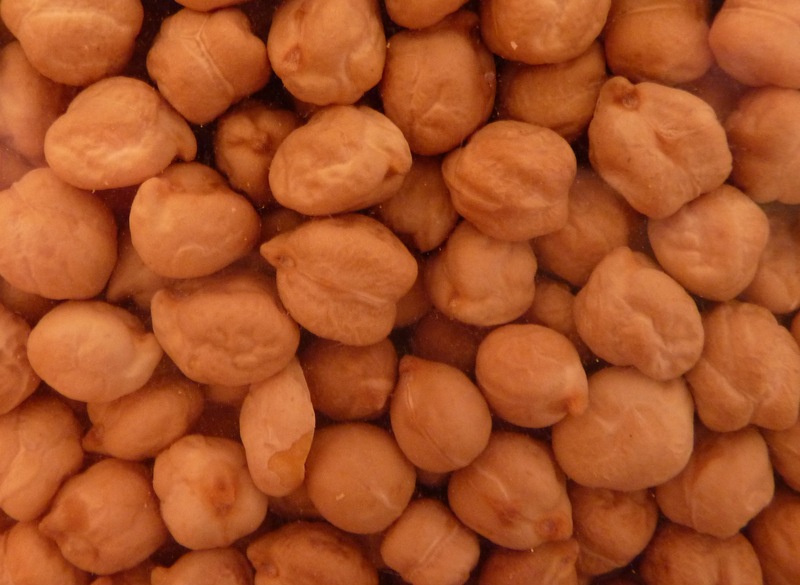 I believe that you can freeze cooked chickpeas, but I always end up eating all of them! They’re delicious tossed into a green salad, and of course you can make hummus. If you want to branch out, here are a couple of awesome recipes to try. You don’t need to cook them yourself to make these recipes; if you’d prefer to use canned, go for it. Warm Chickpea Salad with Cumin and Garlic made more than one appearance on the table this summer. It’s best when made the night before to give the flavors a chance to develop. Also, despite the title, I served it room temperature instead of warm. Warm cucumbers don’t do it for me, but this salad does. I’ve got tons of parsley in the garden, and need to make this at least one more time before gardening season ends. It’s great plain or on top of greens for lunch, and I served it as a side dish with spanakopita (spinach pie). Winner Winner Chicken Dinner is the well-deserved name of this recipe, which I saw on the tv show Mad Hungry. I used boneless chicken and a 50-50 mix of smoked and sweet paprika. The second time I made it, I cut the amount of salt in half, because I thought that the next-day leftovers tasted really salty. This is one of those things I’ll make over and over; the smoked paprika gives it sort of a barbecue flavor, and the dish reheats well (which is good because it makes a ton). Moving on from chickpeas, I came across the recipe for Chicken Tacos with Chipotle Sour Cream in a Splendid Table newsletter. Mexican is always popular at our house, and this mixture of shredded chicken, onions, red bell pepper, and spices is delicious! Note that their estimate of 5 minutes prep time is overly optimistic, at least when I’m the one doing the prepping. I poached the chicken in the slow cooker and then shredded it, but to save time, you could shred some rotisserie chicken. Click the recipe link if you’re not familiar with the Splendid Table; I thoroughly enjoy listening to podcasts of the show. I’m always looking for new ways to serve chicken, so the second and third recipes look terrific! And I’m sure your chick peas were terrific made from scratch. I love that you cooked chickpeas! I’ll post the recipe for the chickpea soup soon because I think you’ll really enjoy it. I quite like chickpeas – they are rather hearty and filling.